On a crisp and chilly October’s day after six years of dating, Lydia and Tim married in a gorgeous Wiltshire village church. Following the service, they wound their way to a farm nearby where they had a marque reception close to the magical Avebury Stone Circle. Tim looked very handsome in tails, whilst Lydia looked incredible in a dress she had made to measure with inspiration taken from an original Le Spose di Gio in Belgravia. The colour scheme for the day was navy blue, which is fairly unusual, but shouldn’t be, as it worked brilliantly. They had lots of guests and a big marquee. Half was a large dance floor with a starlit ceiling, always romantic! The other half was made up of long tables for the wedding breakfast. 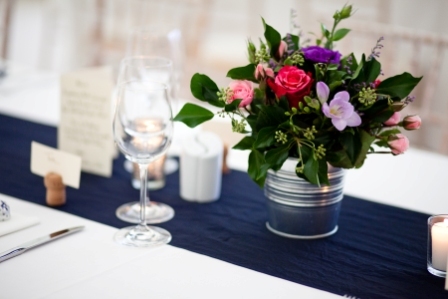 Navy blue table runners created a fresh look during the day, turning into a romantic setting once the tea lights were lit along the tables twinkling as they reflected in the silver buckets of flowers. The navy colour was picked up again in the pretty ribbons edged in silver which had been carefully tied around each napkin. Favours were Baci chocolates, each one wrapped in silver foil with tiny blue stars and containing the most delicious chocolate and a ‘love note’. They glistened in the candle light and bought ‘a touch of Italy’ to the wedding, Lydia’s favourite country. Lydia made her table plan by covering a large piece of MDF with navy paper with silver stars. White name tags were placed on string in front of the paper which looked smart whilst adding another touch of colour to the marquee. 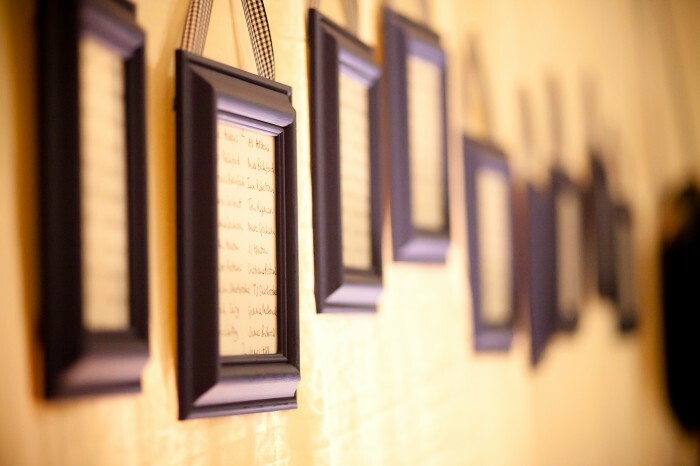 A row of picture frames which Lydia had cleverly painted blue held the table plans and these hung from the walls with navy and white gingham ribbon. 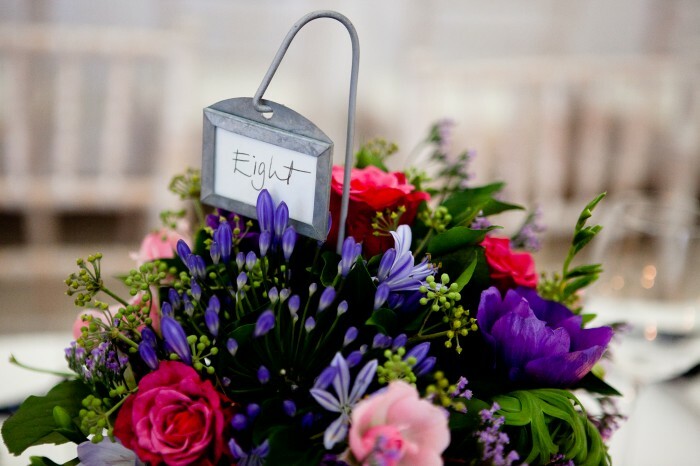 Galvanised buckets of flowers in blue, purple and pink adorned the long tables whilst their table numbers were delicately displayed in small galvanised sign posts within the buckets. Lydia and Tim choose a popular local catering company ‘Sue Brady’ who are based in Marlborough. 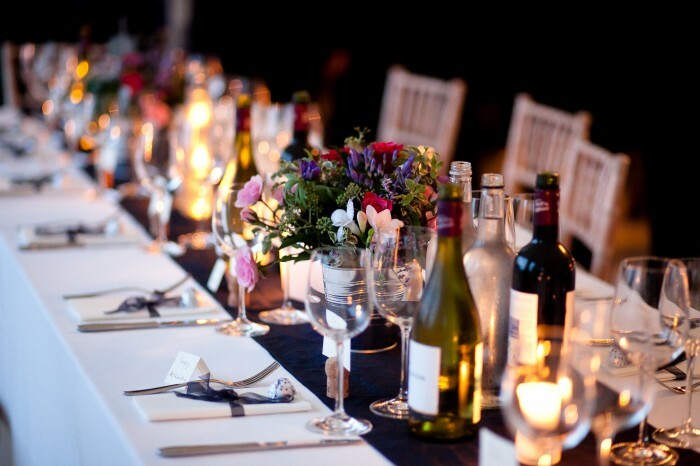 Sue caters at lots of local weddings and is very highly regarded as being ridiculously efficient whilst delivering amazing food. Guests ate a selection of delicious canapés, for their main they choose a wintery sausages, mash and onion gravy, and to finish a trio of puddings Lemon Mouse, including a mouth-watering sticky toffee pudding. Rather than a traditional wedding cake, Lydia and Tim choose to have a ‘cheese cake’. 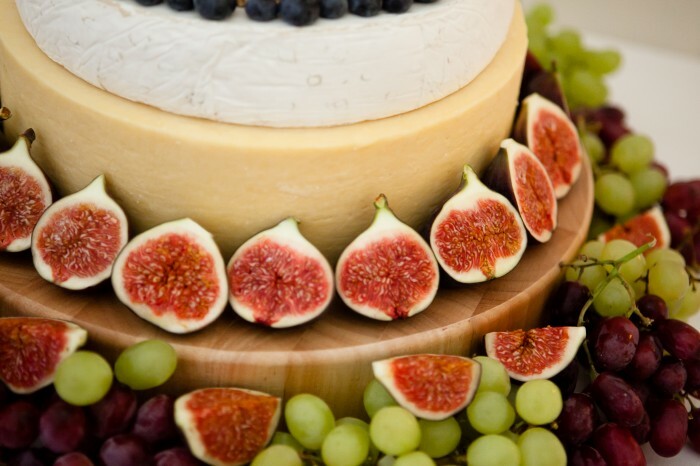 Layers of delicious stilton, brie and cheddar were decorated with fresh figs, grapes and berries, it looked stunning. 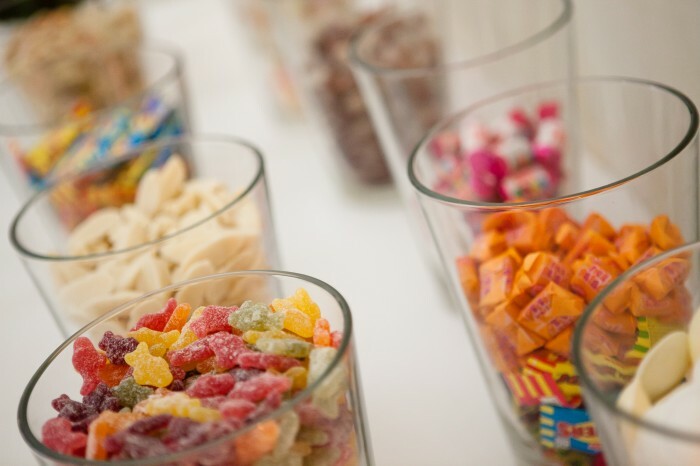 If this wasn’t enough food already, those with a sweet tooth and needing more energy for dancing tucked into large glass jars of retro sweets sat to the side of the dance floor. A really beautiful and fun wedding! I hope you enjoy the photos below. All the props here were hired and available from vintagebluehire.